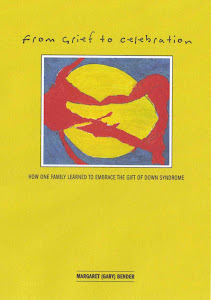 I often wondered what I would do if I found out there was a “cure” for down syndrome. I love Alex just the way she is and certainly she would not be the same person if she did not have down syndrome. She has taught me so much about life, the world and myself. She brings joy to my family, and the lives of everyone she touches. But still I wonder - would I change her? Thankfully, I do not believe I will ever have to make that decision. Those days of dreaming about the magical extra chromosome eater are over. Instead, I dream - how can I improve her life? There are many things I wish were different for Alex. I wish she had more opportunities, I wish we didn’t have to struggle for services and I wish all her dreams will come true. I dream of a bright future for Alex, and all children with down syndrome. How can I not hope for a life where my daughter, and all children with down syndrome, do not struggle with math, or reading or even communication? A life where they can interact with their peers on a more equal level. A future where everyone can contribute to society and not be viewed as a burden? 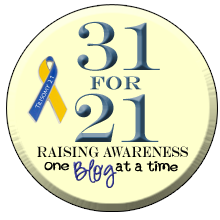 So - I am going to take a stand....I whole heartily support cognitive research initiatives around down syndrome. I have discovered based on some of my web surfing findings, these programs can be a bit controversial. Still, everyone is entitled to their own opinions, and I have mine! We all want the best for our kids – and although we love them the way they are - better should always be an option. Following is some information about cognitive research from the researchds.org web site. Certainly worth the read – whatever your opinion. Fifty years ago, Jérôme Lejeune and colleagues verified a causal link between an extra copy of chromosome 21 and Down syndrome. The exact mechanism by which the presence of this additional genetic material resulted in the cognitive impairment associated with Down syndrome remained unclear, hindering the development of medical therapies. Nonetheless, the quality of life for individuals with Down syndrome improved tremendously in recent decades, as a result of improved health care, expanded educational and community opportunities, and the support of families and advocacy groups. The life expectancy of those with Down syndrome more than doubled, highlighting the importance of the need to attain skills essential for independent living. In 2000, researchers working on the Human Genome Project fully sequenced human chromosome 21, spurring a renewed interest in exploring the pathogenesis of the intellectual impairments of Down syndrome. In the last five years, applying modern scientific tools and techniques, researchers made tremendous progress toward understanding and treating the cognitive issues associated with Down syndrome, successfully correlating cognitive impairment with specific genes, in specific cells, during specific stages of development. The identification of neurobiological pathways that are affected by the presence of additional genetic material now provides a rational basis for the development of drug therapies to address the cognitive impairment associated with Down syndrome. Scientists have demonstrated that a range of issues are altered in Down syndrome, including neuronal system development, neuronal transmissions and instructions necessary for neurons to “thrive” and have examined the impact of therapeutic compounds on memory and learning in mouse models of Down syndrome. These studies have yielded extremely encouraging results. This exciting progress is now prompting researchers and others to change their questions regarding therapies from, “Can this be done?”, to, “When will this be done?”. I am in complete agreement with you. I am very excited about all the research to help people with DS to lead more independent lives. I do not think that by helping improve cognition we are "changing" who our children are. thanks - it will be great to bring more awareness to all these initiatives.. Excellent, excellent, excellent post!! I'm all about research these days, and there are some exciting plans coming very soon to help push this along even further, even faster. Stay tuned... I'm just thrilled to see this conversation going on right now, getting everyone thinking about the endless possibilities that can happen with research for our children, in their lifetimes. I believe science can make positive strides to improve the cognitive and communication skills of our children. I am not always hopeful that science/society will follow-through on this. Deep breath. Too much for a reply. Thank you for bringing this research to your readers, the more people know what medical research is capable of, the more it is likely to be demanded.